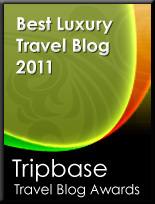 Our Tripbase panel have cast their expert eyes over the most decadent and lavish blogs the Internet has to offer, run them through the rigorous selection process and produced these pinnacles of opulence for your delectation. The following are the very best in the luxury travel Category. Luxury travel doesn't need to be the preserve of the super-rich - indeed, it is a little-known fact that almost anybody can afford to travel in style, elegance and comfort without breaking the bank or even spending much more than travelling ordinarily. The world of luxury travel is actually a very accessible one if you know how to play your cards right. If you look carefully on the internet, you'll find the information which will allow you to travel in luxury for a reasonable amount of money. Whether you want to book a cruise six months in advance, negotiate a five star hotel instead of a three star self catering chalet, get free upgrades when flying on airplanes, or just get a free bottle of bubbly when you check in to a Holiday Inn, we've found all the resources you need. The following blogs win awards for their dedication to bargain hunting, as well as their appreciation of the finer things in life. What these blogs do apart from the competition is present you with the information you require, rather than dodgy deals or one-off vouchers. We feel that these blogs are deserving of not just our award, but your readership.